Most of the following information, and all of the family photographs, come from Nancy Frey, a descendant of Frederick Eli Rodgman. In the following account extra information is in italics, within square brackets. 'The RODGMAN family did not remain long in Ashburton but they made their mark. 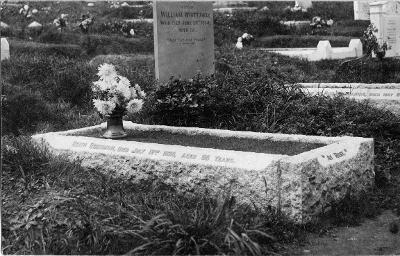 Frederick Eli RODGMAN was born 11th August 1871 in Bideford, the son of George RODGMAN, a gardener, and his second wife Mary Ann HEAL. 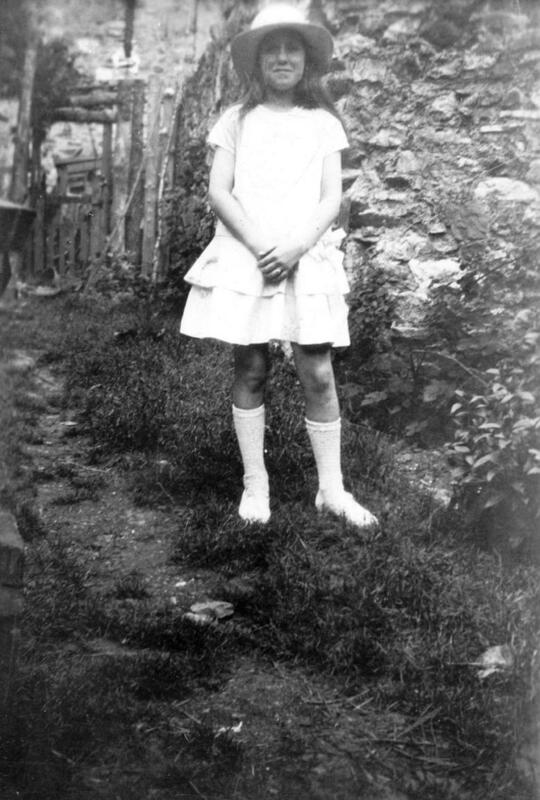 He married Edith Mary NICHOLLS 1 May 1893 in Bideford and came to Ashburton some time between the birth of his daughter Edith 9 Mar 1896 in Bideford and daughter Florence registered 4th quarter 1898 in Newton Abbot Registration District. [On 1st May 1893 Frederick Eli Rodgman married 21 year old Edith Nicholls in Bideford parish church. Frederick, aged 22 and living in Bideford at the time, was a tailor. The birth of Frederick Charles Rodgman, mother's maiden name Nicholls, was registered in the December quarter of 1893 in Bideford. 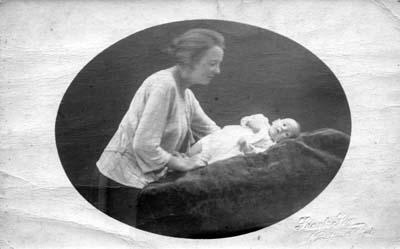 The birth of Edith Mary was registered in the June quarter of 1896, also in Bideford. 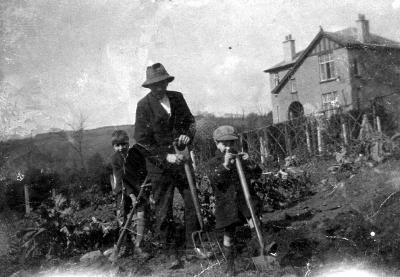 and George Henry's birth was registered in the June quarter of 1900, also in Newton Abbot district. 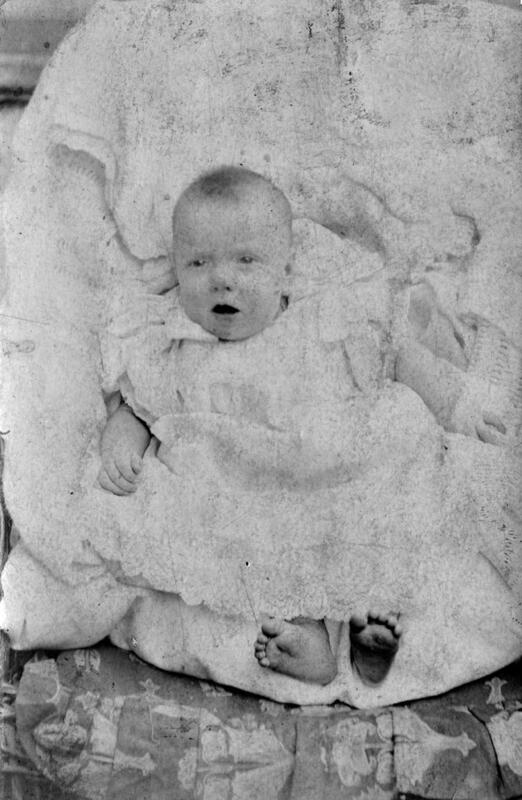 Florence May was baptized in Ashburton in September 1898, with Frederick Eli's occupation being given as tailor. The address of the family was Back Lane. By the time of George Henry's baptism, the address is just Ashburton. 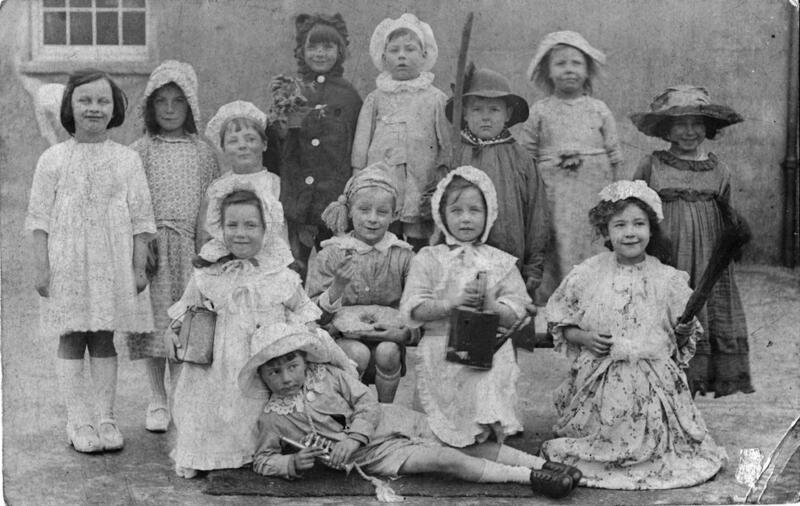 At the time of the 1901 census the couple were living in Ashburton with four children: Frederick C.,7, Edith M., 5, Florence M., 2, and 10 month old George H. The parents and two eldest children were all born in Bideford, whilst the youngest two children were born in Ashburton. Frederick Snr. is a tailor (cutter), and the family's address is shown as Kingsbridge Lane, with Berry's Office written alongside in brackets. I believe Frederick Eli RODGMAN came to Ashburton to serve an apprenticeship with Abraham EASTERBROOK who operated a Tailor & Outfitter shop from his home on West Street, which is today (2018) the Ella Artisan Bakery at 9 West Street. At that time the RODGMAN family lived at Berry's Offices in Kingsbridge Lane and in the 1901 census Frederick Eli is listed as a Tailor/Cutter. 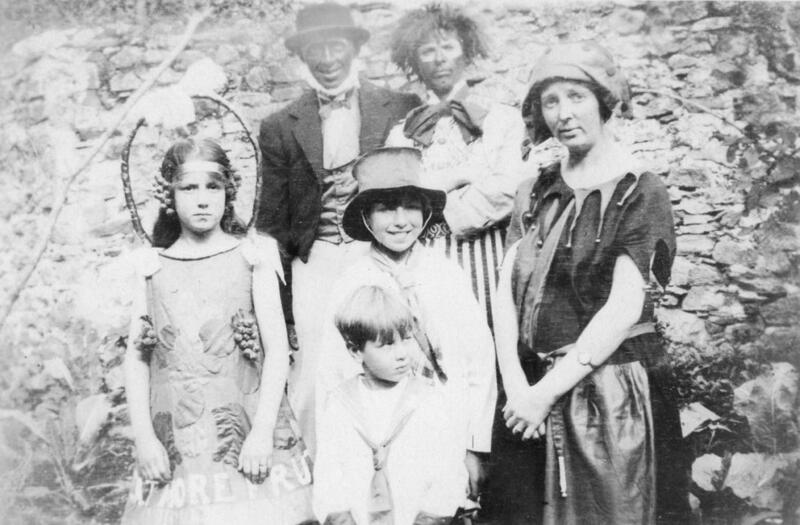 The family were still in Kingsbridge Lane when Archibald Rodgman was baptized in May 1902, with his father being described as a tailor cutter. This relationship appears to have soured as in 1905 the Exeter and Plymouth Gazette headed an item 'Trouble among the tailors' Abraham Kivell Easterbrook sued Frederick Eli Rodgman for £50 damages, for breaking an agreement not to carry on business as a tailor. Mr Rodgman had worked as a cutter for Mr Easterbrook, and on leaving his employment had allegedly agreed not to set up business within 10 miles of Ashburton for 10 years. The case hinged on whether Mr Rodgman had left voluntarily, and as there was some confusion about this, judgment was awarded to the defendant. In 1908 Abraham EASTERBROOK and his family sailed to New Zealand listing himself as a farmer. They went 'steerage'. 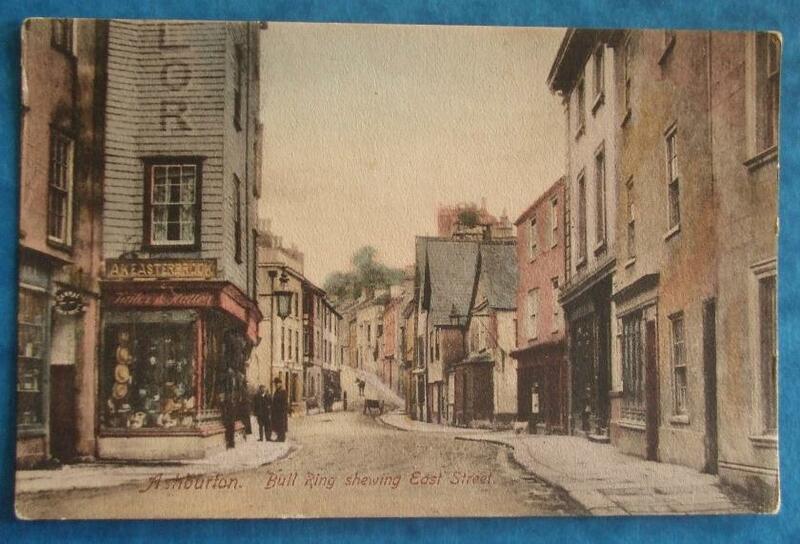 Above: West Street, Ashburton, showing Abraham Easterbrook, tailor, on the left. Having a wife and by that time five children to support, Frederick Eli RODGMAN set up his own tailoring business at 26 North Street, opposite the Town Hall. In the 1891 census the building was occupied by Thomas HILL, a 58 year old Tailor & Outfitter from Somerset. I suspect that Frederick Eli RODGMAN obtained both the leasehold and the business. In the 1901 census Thomas HILL, now a widower, was the owner of a Clothiers next to the Bank House on West Street. The RODGMAN family lived where they worked at 26 North Street. 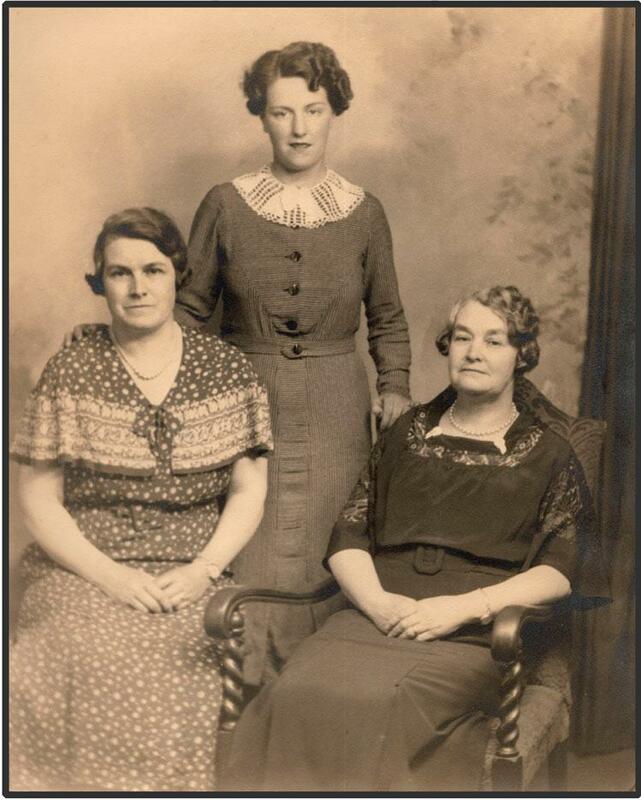 Edith Mary RODGMAN, nee NICHOLLS appears to have been a kindly woman in all the photos I have of her. 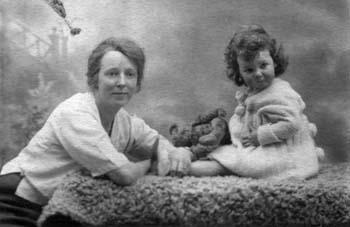 She raised not only her own children: Frederick Charles (Fred), Edith Mary (Mary), Florence May (Flo), George Henry (Jack) & Archibald (Archie), but also my mother Elsie Edith May RODGMAN who she insisted on calling Billie after her favourite songstress Billie Holiday. The children participated in local festivals and plays. [In the 1911 census the family are in North Street. Frederick Eli is a master tailor maker, and his wife Edith is an assistant in the business. Frederick Charles (who signs the census form) is a journeyman tailor, and his sister Edith Mary is a shop girl (drapery). The three younger siblings are at school. 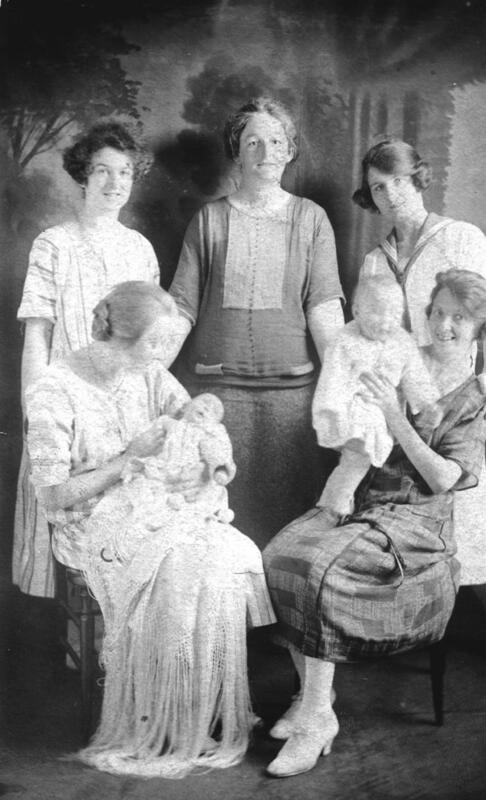 With the family on census night are 19 year old Florence Rodgman, a niece; sister-in-law Ethel Rodgman, a tailor's machinist; Mary Kate Rodgman and Jessie Maud Rodgman, both nieces. These last four were all born in Bideford. 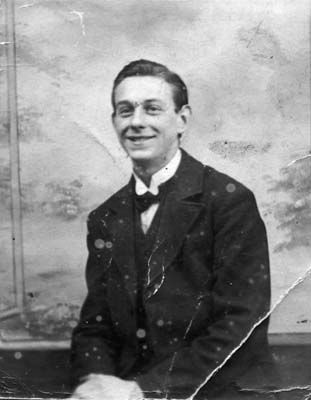 Frederick Charles RODGMAN, my grandfather, the eldest son of Frederick Eli RODGMAN was born 25 October 1893 in Bideford, and moved with his parents to Ashburton. I have yet to find any school records, but he likely received a basic education there. He also attended school in London, and was then apprenticed as a tailor under his father. In 1913 he left to seek his fortune in Canada, taking a position as Journeyman Tailor with the Toronto firm of Hobberlin at Yonge & Richmond Streets. But his stay in Canada was short. After meeting Mabel MERRETT, the love of his life, he was faced with a decision that would change his life forever. War broke out in Europe and Frederick Charles RODGMAN felt compelled to do his part. 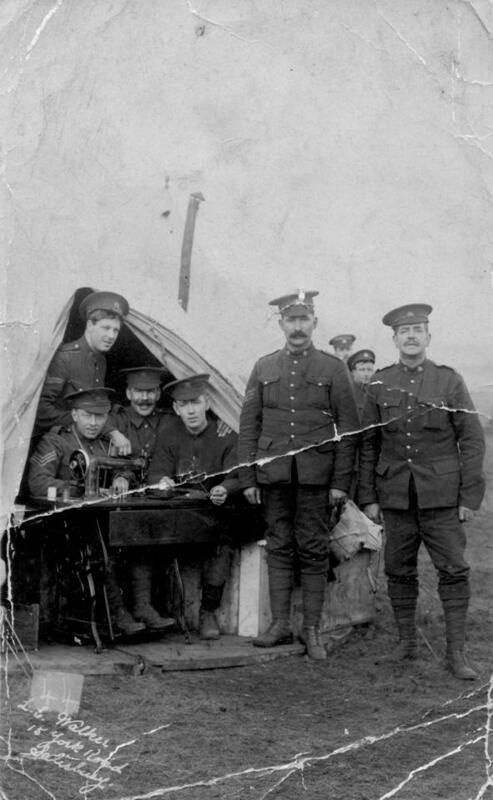 He left his sweetheart behind and enlisted in the Canadian Expeditionary Forces, trained at Val Cartier, Quebec, and sailed for England in September 1914 on the "SS Tunisian". While on board ship, he wrote a daily message to Mabel which he posted on his arrival in Southampton on the 14th of October 1914. That letter is heart-wrenching, and finding it amongst her treasures and reading it, I can understand why she kept it. 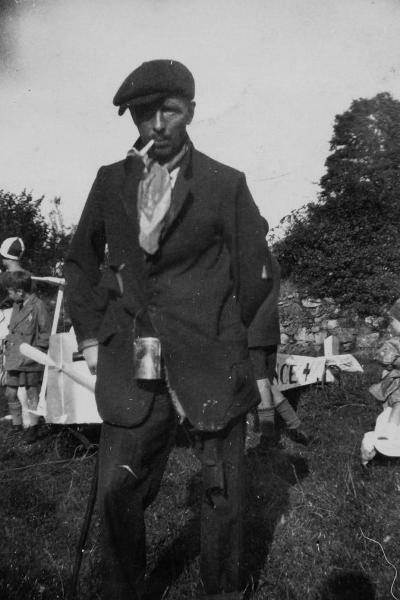 Try as he might Fred was unable to contribute much to the war effort. 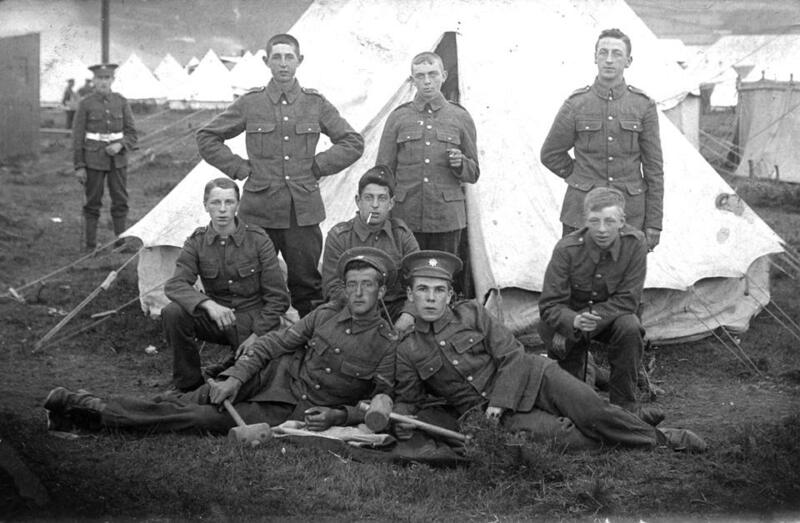 While training on Salisbury Plain he became ill with appendicitis. 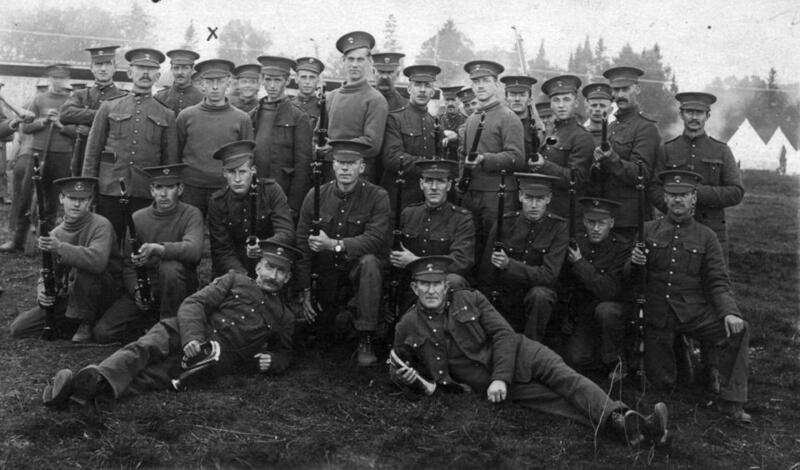 His medical record states he was operated on on the 27th October 1914 in Tidworth, Wiltshire. He spent 7 weeks in hospital then went home to Ashburton for two weeks furlough. 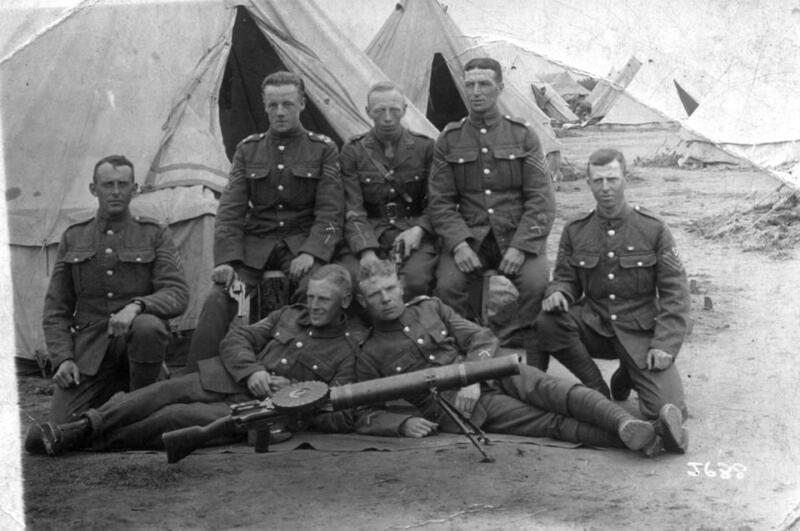 His unit left Bristol for Lazarre, France on the 8th February 1915, February 1915 in Rouen, France and March 1915 in Bologne, France. He was hospitalized as a result of complications from his operation and this time he was sent back to England on a Hospital Ship. 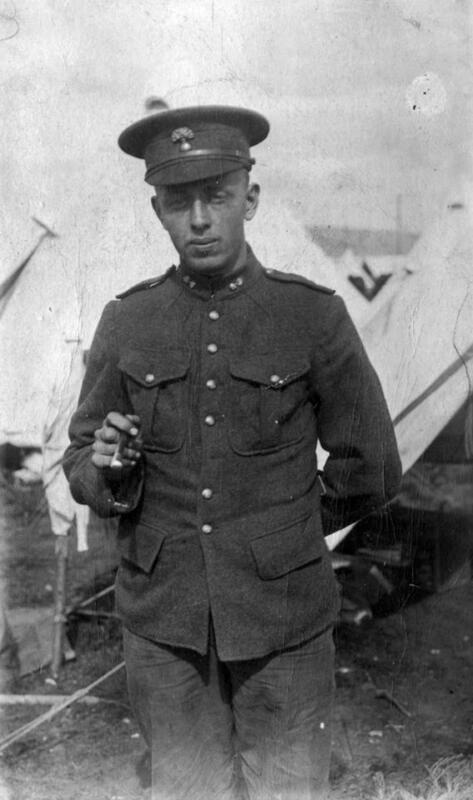 He spent time at the Canadian Military Hospital at Shorncliffe, and was officially discharged from the Canadian Expeditionary Force as a Sargeant on the 22nd June 1915. 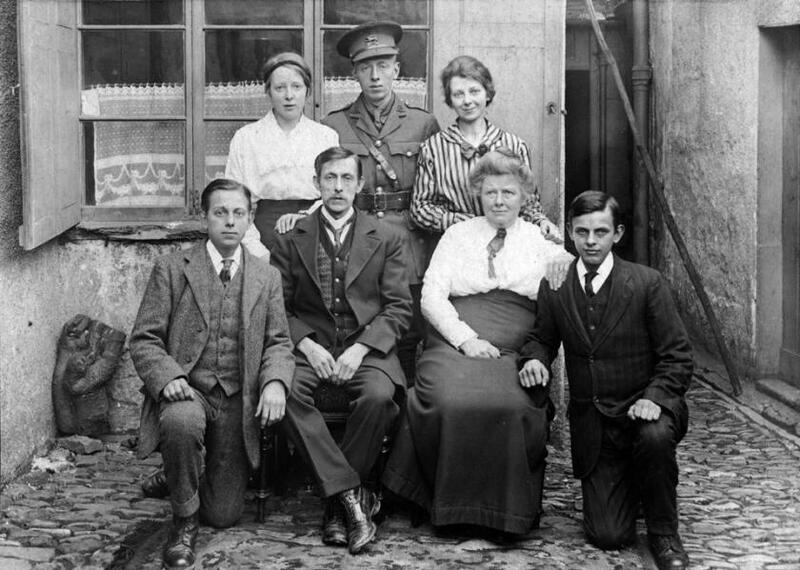 Frederick Charles RODGMAN, 22, bachelor, tailor (journeyman), of 26 North Street (father Eli RODGMAN, tailor), and Mabel MERRETT, 18, spinster, of 26 North Street (father James MERRETT, soldier), were married by licence at the Wesleyan Chapel district of Newton Abbot on the 28th November 1915 by Tomas HOLTON, minister. 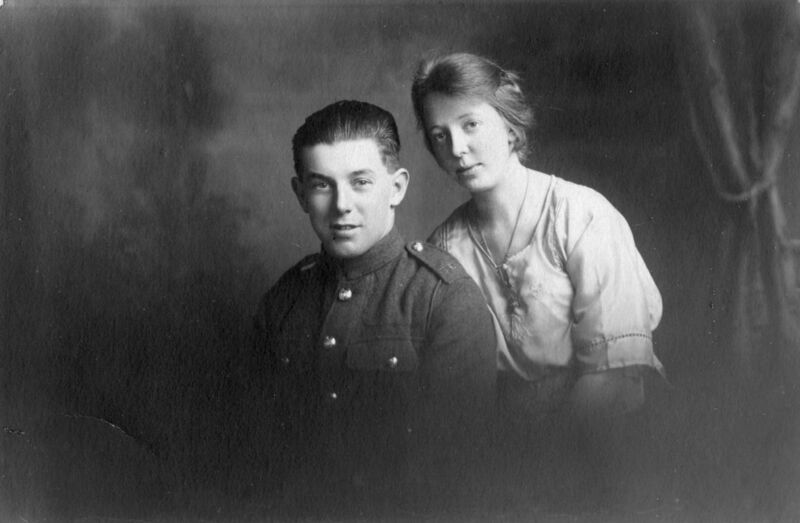 But Fred 'soldiered on' and on 17th November 1916, a month after the birth of his first daughter (my mother), he enlisted in the Leicestershire Regiment. In early 1917 he completed a 20-week officers' training course in Newton Ferrers, Devon and received a commission as a 2nd Lieutenant. 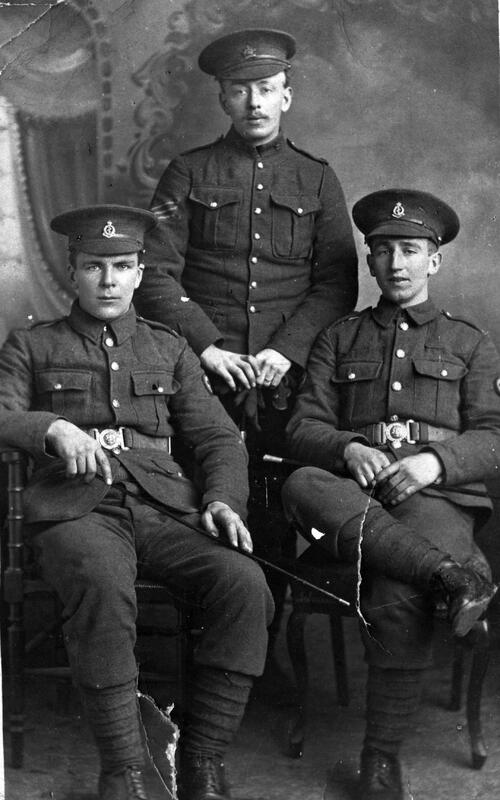 He was then seconded to the 23rd Reserve Battalion of the Canadian Expeditionary Forces but spent most of his military service in hospital with recurring problems resulting from the appendix operation, or at home in Ashburton recuperating. 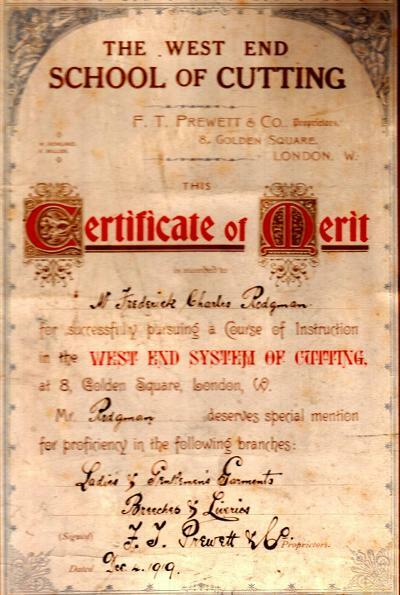 Frederick Charles RODGMAN then turned his attention to tailoring and on 4th December 1919 received a Certificate of Merit from the West End School of Cutting in London, with special mention for proficiency in Ladies and Gentlemen's Garments and Breeches and Liveries. He worked with his father in Ashburton until he took his wife back to Canada with their children. 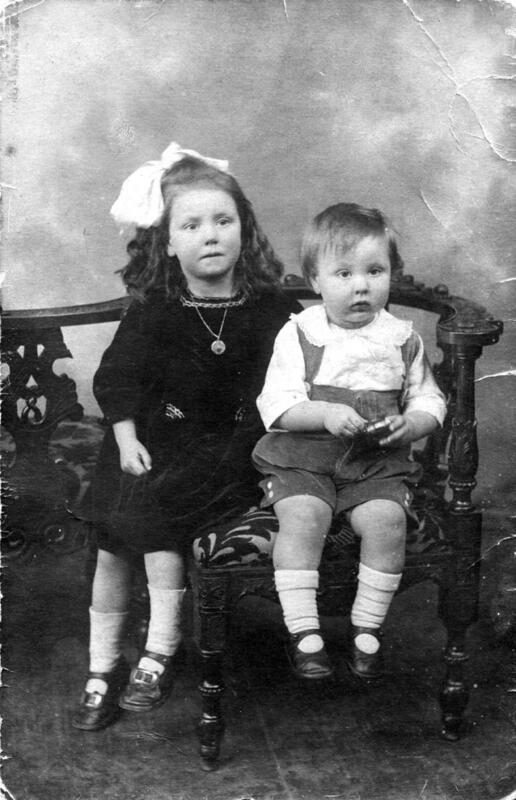 The family grew with the advent of the births of Elsie Edith May (Billie), Oct 1916, Edgar Archibald George (Edgar), Feb 1919, Frederick Charles Jnr. (Charlie), Mar 1923 and Leslie John (Jack) in Mar 1926. 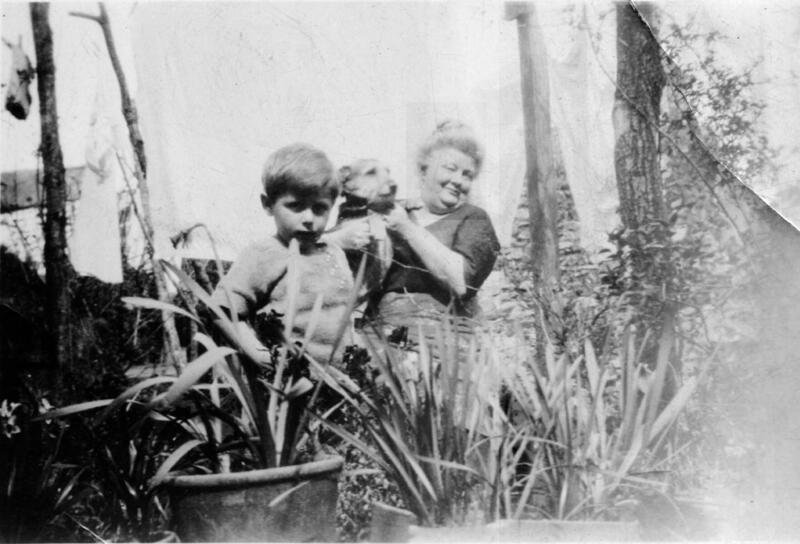 When Edgar came along Mabel Rodgman (nee Merrett) sent Elsie Edith May to live with Elsie's grandparents Frederick Eli and Edith, who raised her. They had a much bigger house and business at 26 North Street while the Rodgman Jnr. 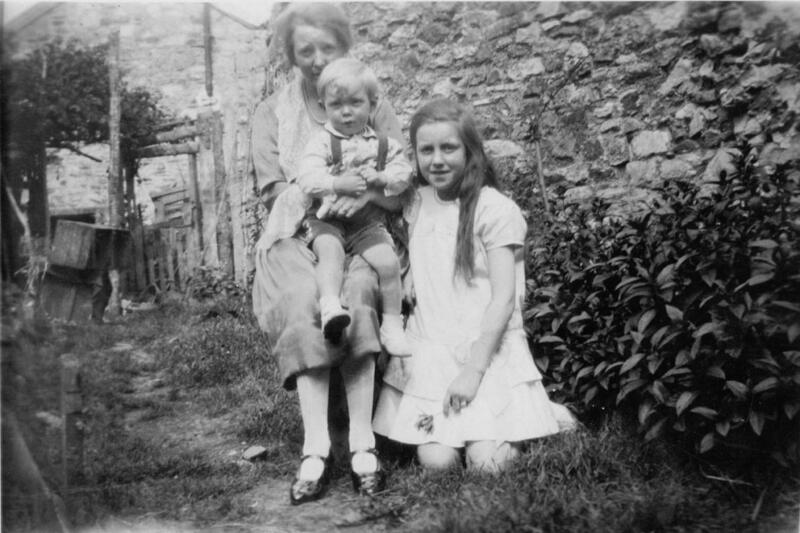 family had a smaller place at 2, Roborough Terrace. 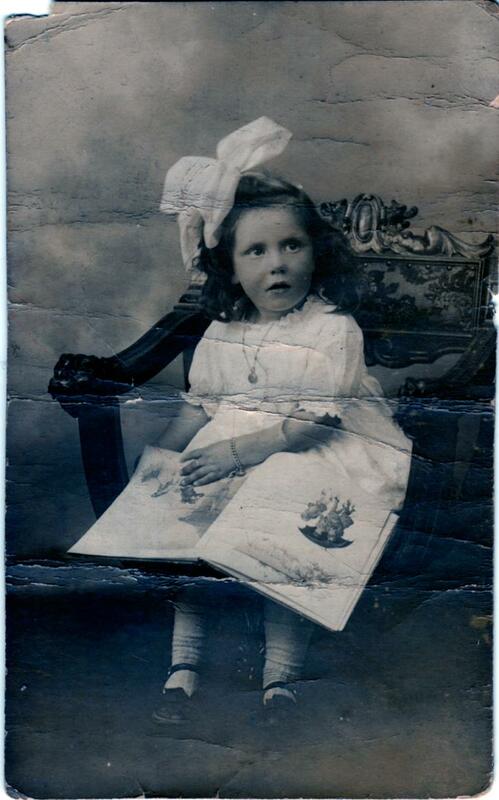 Grandmother Edith, believed to rule the roost, called Elsie 'Billie' (after the singing sensation of the day Billie Holiday) and the name stuck. Right: 2 Roborough Terrace today (2018). The houses are believed to have been built circa 1926/27. 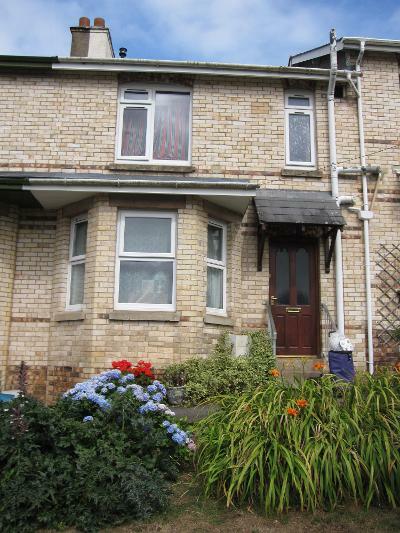 Many thanks to the current occupier for the information and for permission to take the photograph from her garden. 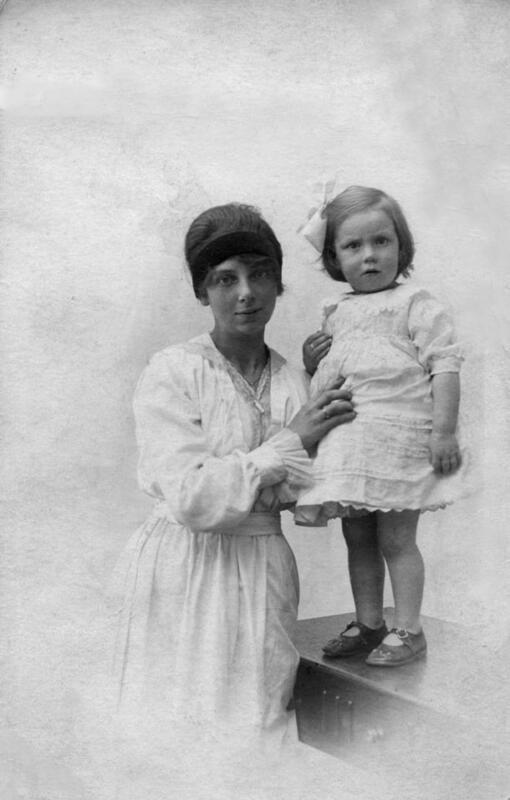 Above: Elsie Edith May Rodgman ('Billie') on the left, with Annie Morrow, taken in Ashburton. 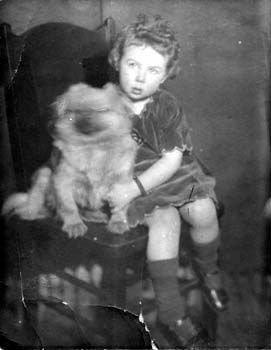 Circa 1927, Billie was about 11 years old. Following the family tradition, the RODGMAN Jnr. children also participated in festivities in Ashburton. 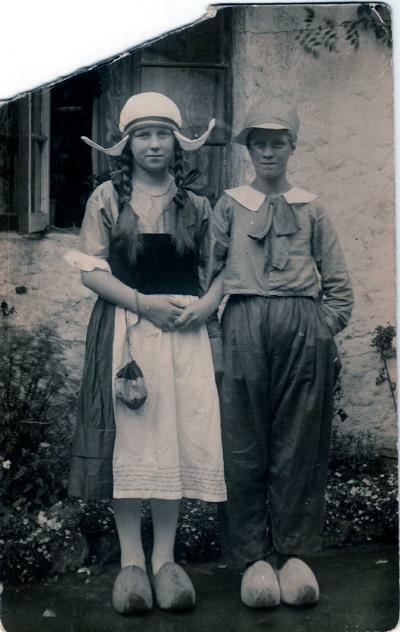 Billie and Charlie were always dressing up, but I don't seem to have any photos of Edgar doing the same - possibly because he became the family photographer. 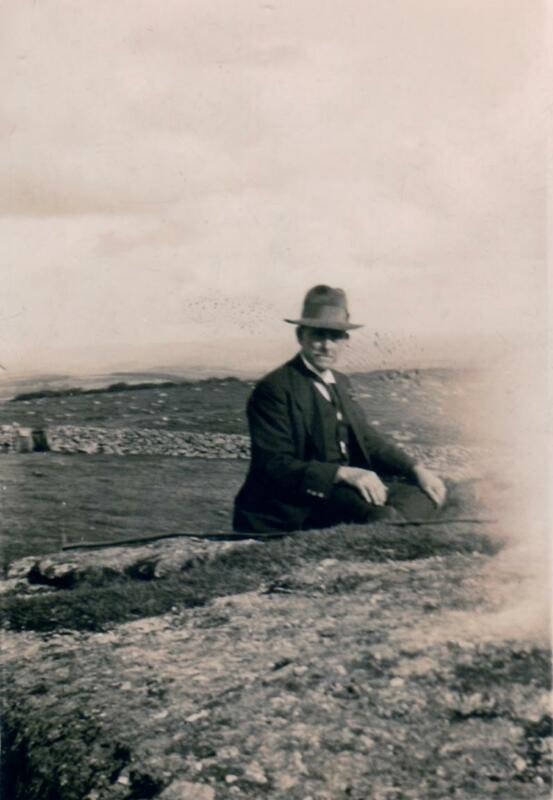 One photo of his father Frederick Charles RODGMAN taken on Dartmoor has a note on the back "This is the first picture Edgar has ever taken. Very good isn't it." 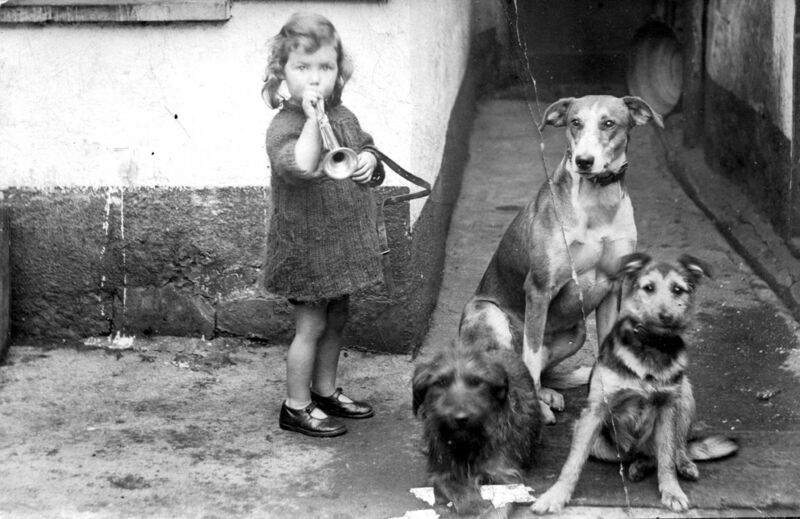 Edgar was only ten when he left England and he went on to take some fabulous photos which he developed himself. 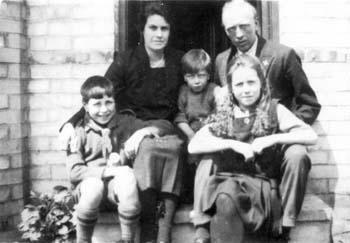 Fred and Mabel Rodgman with their three children Elsie (Elsie Edith May), Edgar (Edgar Archibald George) and Charlie (Frederick Charles) re-emigrated to Canada in 1929. Little Jack only lived for a year. They sailed to Canada on the "SS Ausonia". They landed in April 1929, docking at St. John's, New Brunswick, and took a train to Toronto. 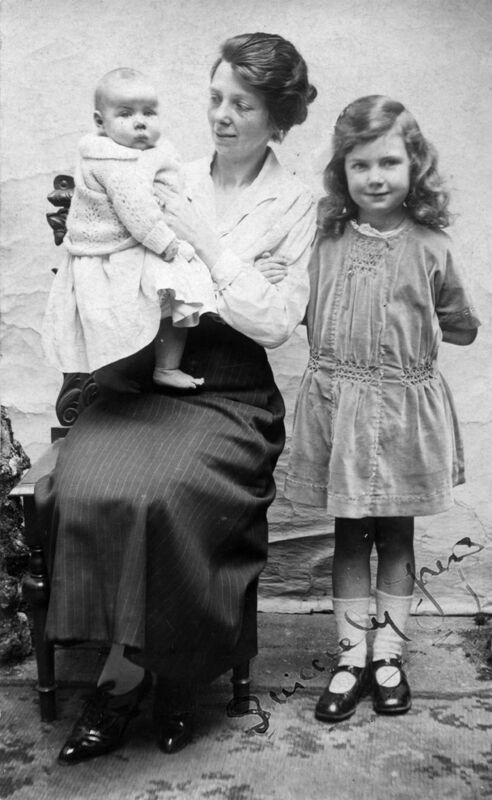 Polly MERRETT, now a widow, followed on the "RMS Duchess of Athol" in 1935. 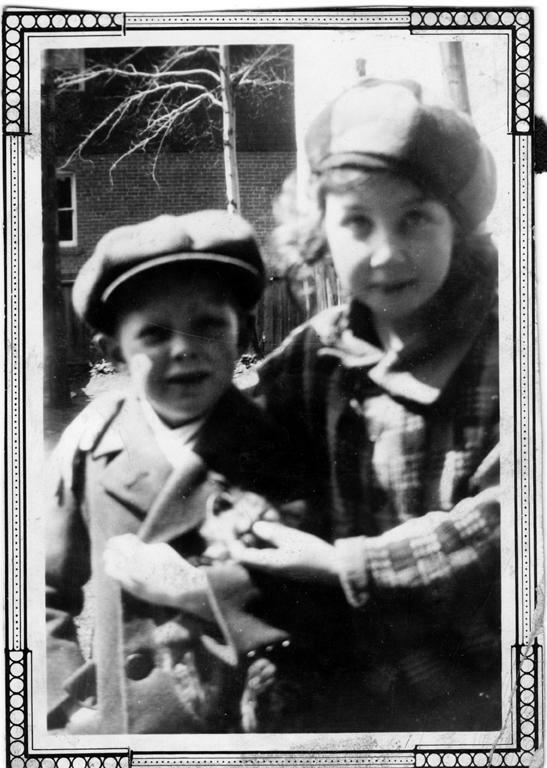 They settled in Toronto, where Fred and Mabel had met, and Fred worked for the legendary Walter Beauchamp Tailors who were on King Street West in Toronto from 1908 to 2014. One of their specialities was riding habits for equestrians, and that became Fred's expertise. With his wife Mabel making stocks and shirts, Fred opened RODGMAN's at 3 Temperance Street (Upper), just off Yonge St. and became tailor to most hunt club and national equestrian competitors in Eastern Canada and parts of the northern US until he retired due to ill health. 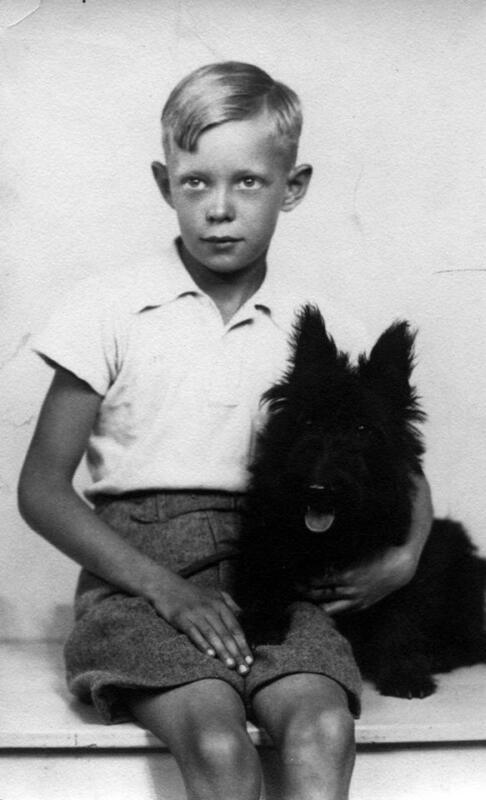 When I was a child my grandfather used to take me with him when he went to estates or hunt clubs for fittings. I was often placed in the saddle and taken for rides around the paddock on hunters or jumpers. One special treat was my first ride in an airplane - a DC3 - around 1948, so that grandpa could fit the jodhpers of an American who lived in Rochester, New York. There was no stretch material in those days. I have two very special things in my RODGMAN collection. One is an oil painting of my grandfather Captain Frederick Charles RODGMAN of the Canadian Veteran Guard done by one of the German prisoners he was guarding during WWII in Canada. The other is a blazer made of "hunting pink" which is a red broadcloth, trimmed in white, made for me by my grandfather and on which I used to display my various sporting accomplishments. 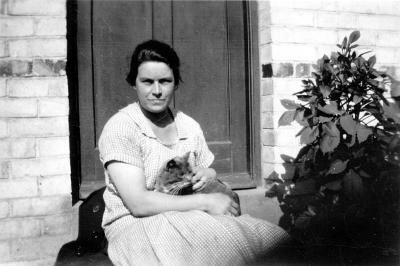 One by one Fred's siblings also married and emigrated to Canada, leaving only Frederick Eli and Edith RODGMAN in Ashburton. 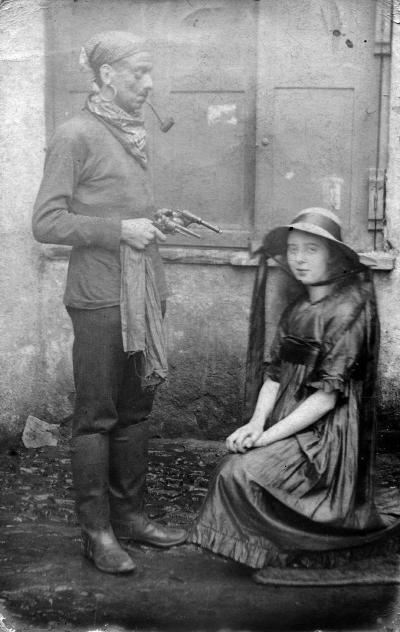 Edith died in 1930 and her widower remarried. 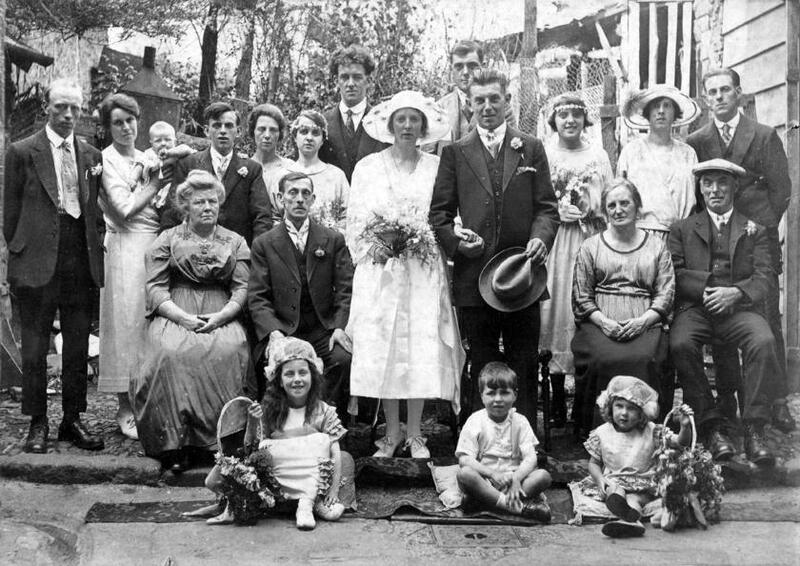 But his new bride Annette (Neta) ROWLAND only had 10 years with him before Frederick Eli died in 1940. 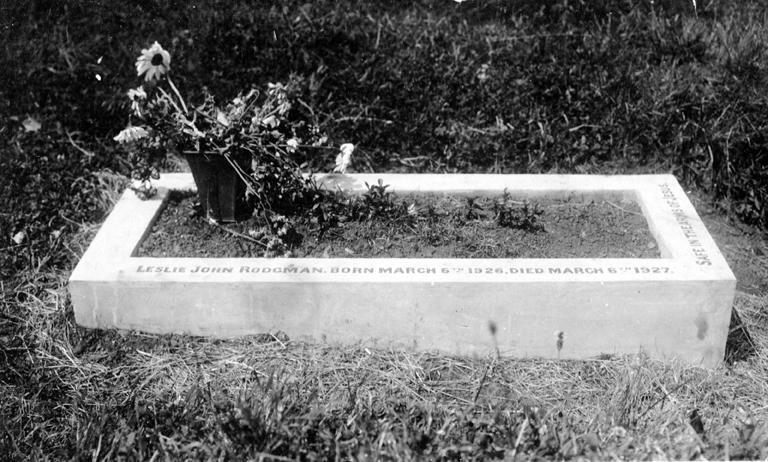 Right: The grave of Leslie John Rodgman, son of Frederick Charles and Mabel. Fred and Edith RODGMAN are buried together in the churchyard at St. Andrew's in Ashburton. 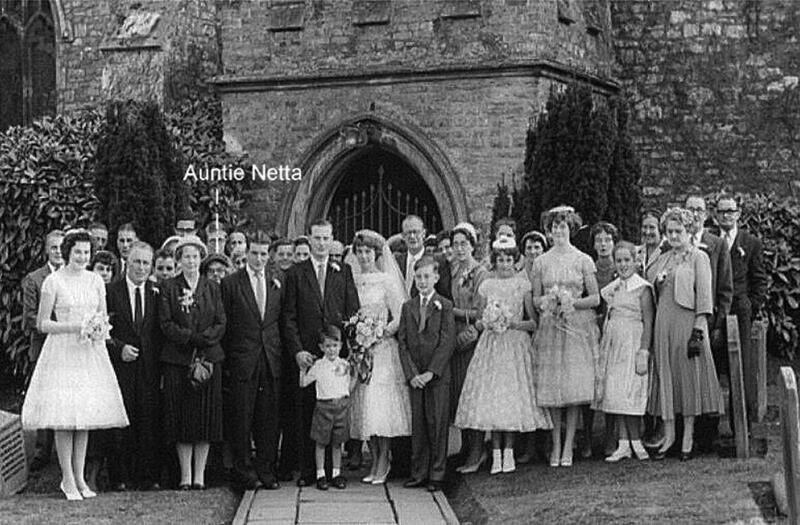 A fellow researcher has sent me a photo of Neta RODGMAN, now a widow, at his wedding in 1959. I do not know what happened to Neta RODGMAN. 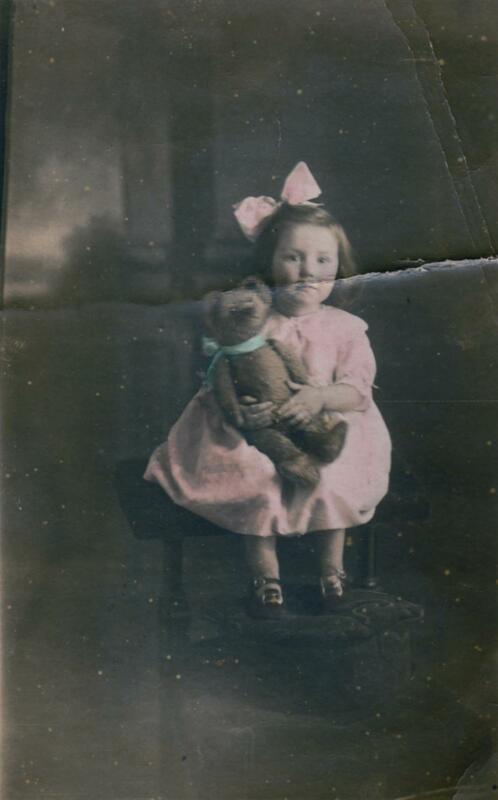 The RODGMAN family were avid photographers and my grandmother, my mother and I are packrats. I ended up with boxes and boxes of photos and memorabilia which I am just now wading through and scanning for posterity. 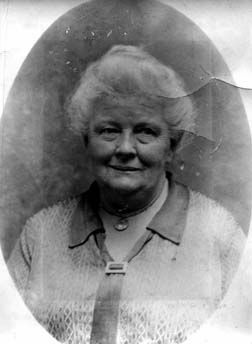 Edith M Rodgman married Edgar C Kelly in the Newton Abbot registration district in the March quarter of 1916. This marriage fits in with information from Nancy Frey, who believes that the family remained in Ashburton. 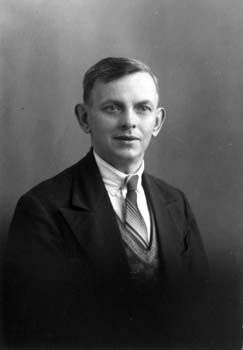 In 1920 Edgar Christopher Kelly is on the electoral register, living in North Street, Ashburton. In August 1926 Archibald Rodgman and Edgar Kelly, both of North Street, Ashburton, embarked at Liverpool to travel to Quebec. 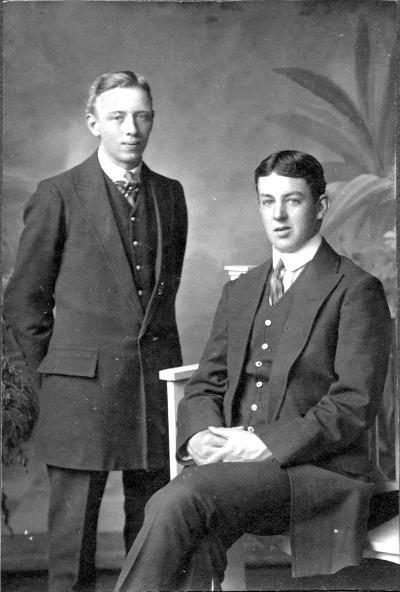 Archibald, aged 24, was a railway fireman; Edgar, aged 33, an engine driver. 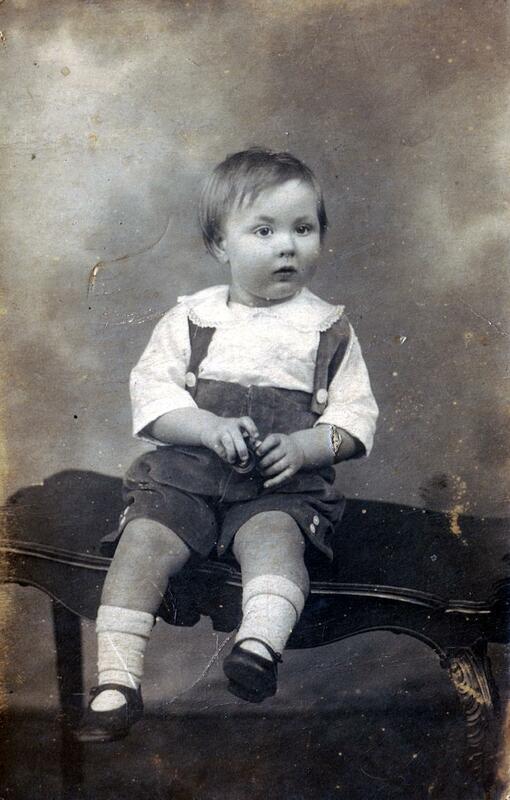 Frederick G R Casely's birth was registered in the Newton Abbot registration district in the September quarter of 1925, with the mother's name being given as Rodgman. 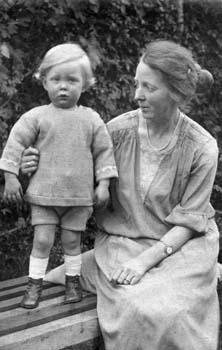 In March 1928 George and Florence Casely, and their 3 year old son Frederick, left Southampton, destined for Halifax, Canada. Their address in the UK was 26 North Street, Ashburton; George was a baker by trade. George Henry Rodgman, known as Jack, was the black sheep of the family. In November 1937 George Rodgman of North Street, Ashburton, embarked at Southampton for Quebec and Montreal. Aged 38, he was a tailor like his father. Left: Jack Rodgman and Towser. 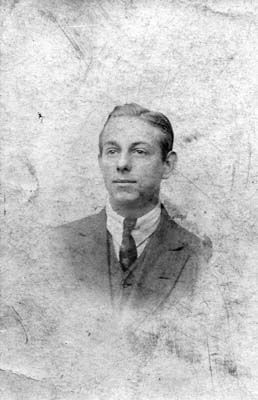 Archibald Rodgman is probably the A Rodgman who after an examination was allocated one of 8 free places at Ashburton Grammar School in 1914. The examinations were open to scholars from elementary schools aged under 13. 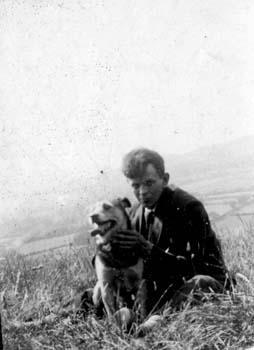 Archibald Rodgman married Margaret Llewellyn in the June quarter of 1923, in the Merthyr Tydfil registration district. 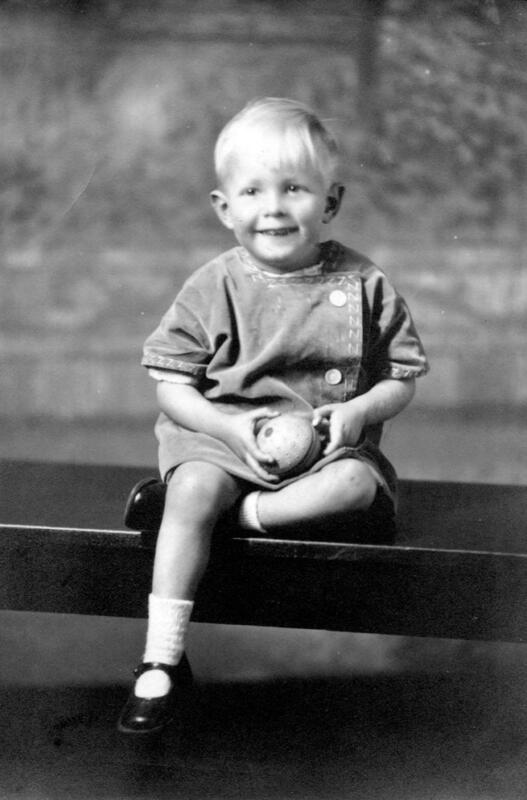 Their son, Frederick A(lan) Rodgman was born in the March quarter of 1924. 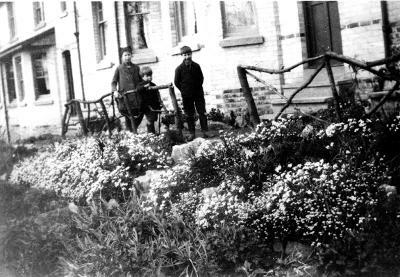 Left: 26, North Street, Ashburton, where Elsie Edith May Rodgman lived with her grandparents Frederick Eli and Edith. 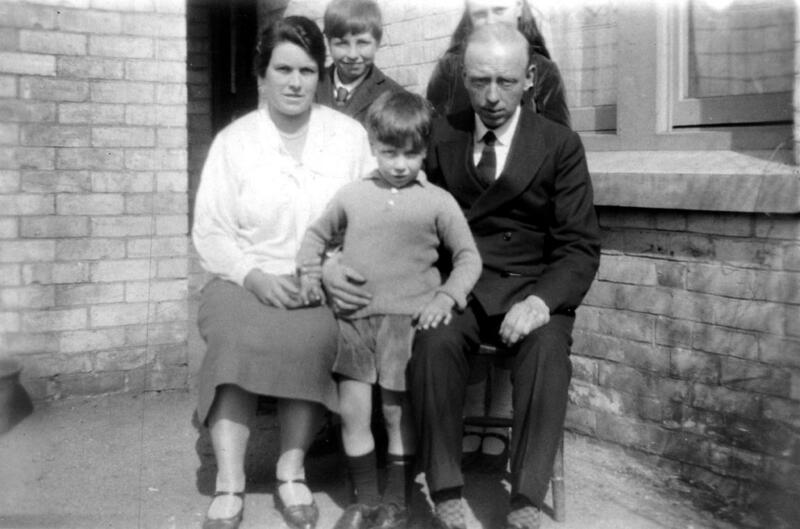 At various times Fred's siblings also emigrated to Canada, leaving only Frederick Eli and Edith Rodgman in Ashburton. Graeme, a son of Frederick Charles Jnr., and Christopher, a grandson, became, respectively, a doctor and a psychiatrist. Dr Graeme Rodgman and his then wife Dr. Susan Rodgman travelled with the royal family on one of their visits to Canada. Many thanks to Nancy for this.